Let's say we were to take this whole light lunch gubbins to a media consultant. Mr Clifford, we'd say, how can we best publicise these cafe outings to a mostly uncaring public? Ah, Max would say: what you need is a celebrity. Oh, we'd reply, we nearly had that Fabio Capello at Origo. No, he'd explain, you need someone there at the time, a personality, a household name. OK, we'd say, shuffling off, we'll think about it. So there we were soaking up some early March sunlight outside the south-facing Sunrise Cafe, fittingly enough, when Andy looked over my shoulder and said, "Isn't that Mark Murphy?" No no no, says Max, I don't care how many Sonys he's won, some local radio bloke won't cut it. Think bigger, think national. Minute or so later, Andy glances up and remarks, "That bloke who's just walked in: isn't he that Blue Peter chap from way back? Not John Noakes, the other one." In I went to order a coffee and sure enough, putting away a big breakfast is, drum roll, Peter Purves. Says Max, I guess he'll do. Many are the choices at the Sunrise -- bit like Jack's -- and that's excluding the multitudinous specials described on the lumo cardboard stars. To demonstrate our diversity, G. had the chicken curry, A. the (neatly presented) breakfast and E. the Spanish omelette & chips. Muchos eggy goodness. As I splashed on the brand-free ketchup and we deployed cutlery, a seemingly dodgy lookin' fella at the next table acted as doorman for folk who couldn't deal with the pig-of-a-door, and so proved himself a perfect gentleman. 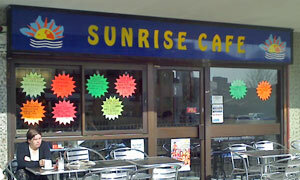 Mid-terrace 70s setting is reminiscent of the 'Stowe's Family Cafe, while the friendly and helpful staff (mayo? sauce? how was that?) took me back to the Central Canteen. No wonder it's busy, and we were lucky to grab our prime open air seats with their wondrous view of, er, Tesco's. Those with more wrinkles, inc. me, may remember Hedley's Grill Cafe facing onto St Matthew's Baths. I'm sipping my milky coffee as PP ups and leaves, returning by the looks of it to Radio Suffolk. Thanks, Pete, for coming and providing a cool way to kickstart this week's review. If it was a car -- Suzuki Grand Vitara. If they were passing by -- Peter Purves.